KAWASAKI’S Z1000SX has been given a round of updates for 2016 including a slipper clutch and ABS as standard, with no increase in price. The sports tourer also comes in new colours options, as does the Versys 1000. Kawasaki says the Z1000SX’s new assists and slipper clutch makes the lever 30% lighter to pull as well as reducing the tendency of the rear wheel to lock under engine braking following aggressive down-changes. Visordown first told you the model was getting a slipper clutch back in June. 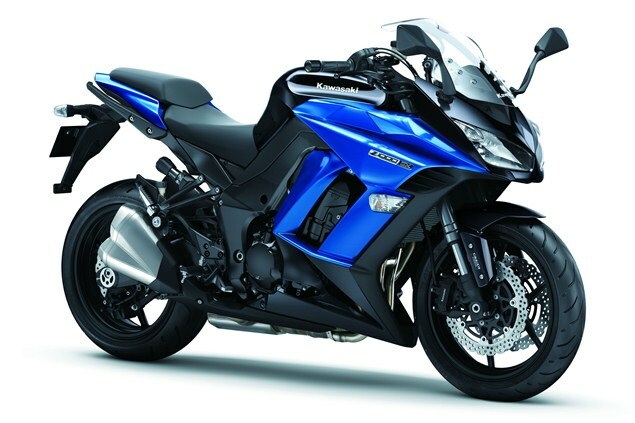 The Z1000SX comes in a new blue colour scheme while the green option has a ‘more aggressive treatment’ according to Kawasaki. It’s also available in metallic grey. The Versys 1000 comes in new metallic grey and ‘metallic raw titanium’ options as well as the existing green scheme. The Z1000SX still costs from £9,699 plus on-the-road charges while the Versys 100 has risen by £200 to £9,949 plus OTR. See all the colour options in the gallery under this story. Since its launch, the Kawasaki Z1000SX has dominated the sports touring segment. Kawasaki’s number one best seller has been upgraded for 2016 with a number of customer-centric features including: an FCC Assist and Slipper Clutch, ABS as standard and new colour options with the added bonus of no price increase. The Versys 1000 colour options have been refreshed for 2016. The 2016 Z1000SX now comes with a race-inspired FCC assist and slipper clutch – with a 30% lighter feel at the lever, the Slipper Clutch will appeal to both sports bike riders and those adjusting to the weight of a pillion and luggage. Under normal riding conditions, the clutch functions as a self-locking mechanism, pulling the clutch hub and operating plate together to compress the clutch plates. This allows the total clutch spring load to be reduced, thereby resulting a lighter clutch lever pull when operating the clutch. While the back torque limiting or ‘Slipper’ function works in the traditional way; where the clutch partially disengages or “slips” when the rear wheel tries to drive the engine faster than it would run under its own power. All 2016 Z1000SX models will be ABS as standard and there is no price increase for the 2016 model. Along with additional features, three colour choices on the Z1000SX continue for the 2016 machines. The Candy Lime Green option has a sportier and more aggressive treatment and Candy Plasma Blue makes a welcome return to the Kawasaki colour charts with Metallic Carbon Gray completing the line-up. The Versys 1000 has been refreshed for 2016 – the Candy Lime Green option has been joined by Metallic Carbon Grey and Metallic Raw Titanium rounding out the options. All 2016 Z1000SX and Versys 1000 models are available on the Black and White finance campaign as their 2015 counterparts, meaning that you can find a finance option to suit you. With an APR of just 4.9% APR Representative over 37 months, the K-Options promotion is available in all Kawasaki dealers. Craig Watson, Kawasaki UK Sales Manager, said: “Our engineers continue to work hard to ensure that the Z1000SX will stay at the top of every riders wish list, it’s feature laden and remains such a strong proposition as the all rounder that can a tackle a track day or a two up trip to Europe. We are sure that the new 2016 model will continues to be a best seller for our extensive dealer network.